Our discussion about a hepatitis alternative medicine, start from our organ named liver. Our liver is not an unimportant organ. It has many uses to our body. Is to product gall liquid, and send it to duodenum (top part of chitlings), to be used to absorb and digest fat inside intestine, when you consume fatty food. Liver also organize carbohydrate metabolism, protein, fat, vitamin and other nutrients, beside produce energy and vitality. It more over, play a role to protect our body from noxious substance as a detoxic agent. Unfortunately beside so many expediencies, liver also vulnerable toward many diseases. Virus infection, bacteria, parasite, gall stone, noxious substances impact, and various of tumor can attack it at any time. When our liver in danger, there are some herbs we can use to protect it. One dangerous treat called hepatitis. hepatitis most often caused by of virus, parasites or bacteria infection, chemical substance effect and bad nutrient. Among herbs that have been researched, sambiloto (Andrographis paniculata), meniran (Phillantus niruri L.), and wild ginger are believed have benefits as a hepatitis alternative medicine. Sambiloto contain of diperpena plankton substance, well as a exemptional substance or as a glycoside substance. 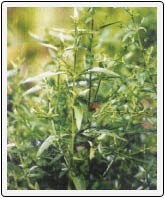 For example, as andrografolida, deoksi-andrografolida, 11, 12-didehydro-14-deoksiandrografolida, neoandrografolida, homoandrografolida, androgr upright afolida and androanosida. Pharmacology activity that sambiloto has are anti-bacteria, immune stimulant, heart depressant, hypertensive (blood pressure reducer), hypoglycemic (diabetes abating agent), anti-inflammation, antipyretic (fever abating agent), and anti hepatotosik. Sambiloto effectiveness to improve body immunity has proved by research. Sambiloto also used to treat hepatitis infectious (caused by infection) . Sambiloto as immunity stimulant has been proved to a mouse. As much as 861.3 mg/kg BB of ethanol extract applied to a mouse. Result, occurred a liver cell toxicity reducing, caused by CC14. Reducing of enzyme activity, push liver net recovered and reduces inflammation potency. Beside sambiloto, meniran (Phyllanthus niruri L.) also often be used as hepatitis alternative medicine. Quote from Thyagarajam and friends research, It is proved that if a capsule contain of 200 mg of driyed meniran powder given to people, tree times a day for 30 days, it will release them from status as hepatitis B virus carrier. And it can be defensible for a few months after therapy has stopped. In order to permanently heal, therapy must continued until their free from hepatitis B virus carrier status become stable. You can use both fresh or dry meniran as a hepatitis herbal medicine. Meniran contains of lignan, semisal filantin, hipofilantin, nirantin, nirtetralin, filtetralin, lintetralin, seko-4hidrolintetralin, seko-iso-arisiresinoltrimetil eter, hidroksinirantin, dibenzilbutirolakton, nirfilin, and filnirurin composites. Also flavonoid composite like kuersetin, quersitrin, isoquersitrin, astragalin, rutin, kaempferol-4-ramnosida, eriodiktiol-7-ramnosida, fisetin-4-O-glukosida, 5,6,7,4’-tetra hidroksi-8-3(3-metilbut-2-enil) flavonon-50 rutinosida (nirurin), that has 2 cluster of glucose (ramnose and glucose). Which its aglikon compoded of 5,6,7,4’-tetrahidroksi-8-(3-metibut-2-enil) flavonon or nirurinentin. The other composites, alkaloid having a form as 4-metoksi sekurinina, ent-norsekurinina, triterpena composite grouped to lupana (lup-20 (29)-en 3’-ol and its derivative), ester composite, ftalad acid, risinoleat acid, linolead acid, linelonat acid, vitamin C, tannin. Active composites contained inside meniran, can push arise of hepatitis B antigen surface inside hepatoma cells (liver cancer cell) on human. While its akuantik extract block polymerase DNA endogen enzyme activity, that is needed by hepatitis B virus to multiply its cell. The other benefits are, seroconversion to antigen endogen of hepatitis B virus (HBsAg) from positive to negative, and to hepatitis B virus endogen antibody (HBeAb) from negative to positive, so it will increase resistance to hepatitis B virus. Filatin and hipofilatin also have benefit as antihepatotoksik, because they can reduce GPT and GOT enzyme activities. So that liver cell damage caused of infection can be prevented .